We Are The Ones We Have Been Waiting For… NEW & FREE! A Song for the spirit of our times. Feel free to download and share! The Heaven and Earth Community Songbook from Findhorn. 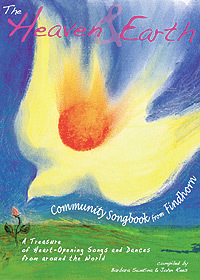 The Heaven and Earth Community Songbook from Findhorn is here! It is spiral bound for easy use, on environmentally friendly paper and ink and has beautiful illustrations by my friend Francois Monnet. My mission is to bring beautiful spiritual music to the planet. I hope you will enjoy the book and please let anyone know, who could benefit from such a collection! For physical shipments, postage & packaging is FREE within the UK, please add £4 for EU and £6 Worldwide respectively to your basket when you are finished shopping. If you buy more, you don't have to pay more! If you do not wish to use our online shop, please contact us for alternative ways of ordering and paying.